For long, residents of Sultanpur village would travel 17 kms to the district office in Raj Nagar, Ghaziabad, if they needed to get birth, death or caste certificates or PAN or ration cards. If these documents were needed urgently, it was taken for granted that they’d have to approach a tout who would charge them anything between Rs 500 and Rs 2,000. 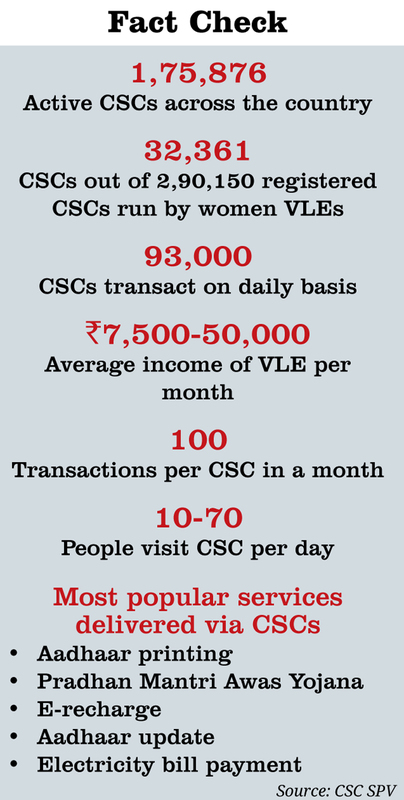 A common services centre (CSC), established in 2014, changed all that. The Sultanpur gram panchayat is among 1.7 lakh that now have CSCs, which are changing the way government services are delivered. CSCs were an integral part of the UPA’s Rs 30,000 crore National e-Governance Plan (NeGP), launched in 2006. The original plan aimed at having a CSC at one lakh gram panchayats; in 2015, the NDA relaunched it as CSC 2.0 with the aim of ensuring that all government services could be delivered electronically at all 2.5 lakh gram panchayats across India. The number of villages (as opposed to gram panchayats) in India is about 6 lakh, and the idea is that all villagers should be able to access government services without having to travel too far. 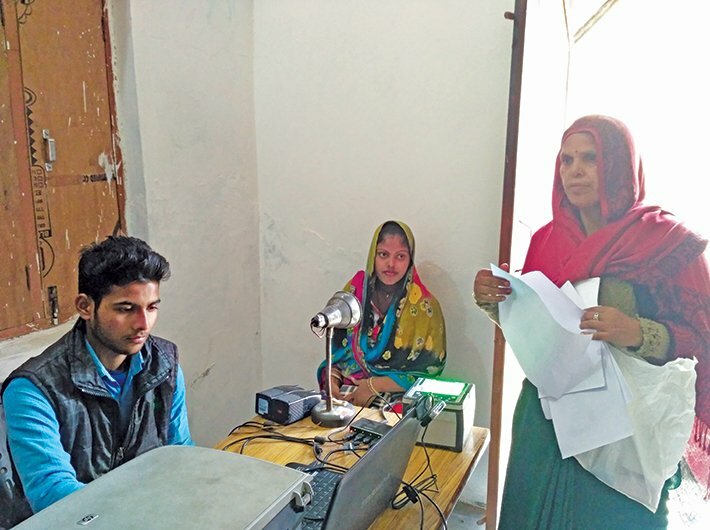 READ: "By Sep 2018, we will have broadband in every village"
Farshwal operates from a one-room centre, where three employees help people obtain or have corrections made to Aadhaar and PAN cards, collect various government certificates, file complaints, apply for government jobs, make bill payments or recharge cellphones or internet connections. Since most visitors come with Aadhaar queries, he has assigned one employee to handling only Aadhaar-related work. Other queries usually relate to widow pension, income and caste certificates, etc. Farshwal says he earns RS 30,000-35,000 per month in commissions, which is enough to run the centre and pay salaries. E-Governance Services India Ltd, an independent agency of the government for implementing and monitoring the CSC network, pays VLEs like Farshwal Rs 60 for every Aadhaar card generated at their centre. Also, of the Rs 25 charged for updating Aadhaar cards, Rs 20 is paid as commission to the VLE and the agency keeps the rest. There are commissions for rendering other services too. Farshwal’s diagnosis of the delay – and subsequent correction – comes from ground-level experience. It matches the diagnosis of officials from the implementation side of the project. The NeGP had three components: infrastructure, middleware and services. The infrastructure component included data centres, wide-area networks, and CSCs. The middleware comprised software and linkages between various state and central government departments at all levels. The third and the most important part was services, mainly those offered by the district administration, the centre, and the state government. Trouble was, for some reason, the cabinet chose to approve CSCs before organising the services to be delivered – in 2006, immediately after the cabinet sanctioned the e-governance plan. However, the provision of services took four or five years – the reason why the official called CSCs shops without wares. The rollout strategy for CSCs was as follows: the funding was largely from the centre, but the state government was to shortlist state-level service centre agencies (SCAs), which were private agencies, through open tendering. The SCAs were empowered to appoint VLEs to run the CSCs and were free to work out the details of the cost of setting up kiosks, sharing costs and profits, commissions on each service and so on. A common complaint heard was that, in many cases, SCAs designed the contracts to favour themselves, extorting a maximum share of commissions from the VLEs. For thousands of VLEs viability was a nightmare: in the initial seven-eight years, there simply weren’t enough public services to offer. State-level services, such as those provided by district authorities, weren’t available online because the districts hadn’t gone online. Even today, the e-district plan hasn’t been implemented in over 100 of India’s 700-plus districts. Countrywide, agricultural and land records, and police, health, education and panchayati raj departments are still in various stages of being brought online. No wonder, in those early years, in Bihar and in many other states, VLEs ended up taking SCAs to court. Many SCAs, including 3i Infotech and Comet backed out in the initial two-three years. Almost all SCAs complained they had “burned their fingers”. Bihar, Punjab, Goa, and Haryana couldn’t roll out CSCs for many years. And many CSCs just shut shop. Between 2014 and 2016, in annual submissions to a parliamentary standing committee, the officials have maintained there are over one lakh CSCs and two-thirds of them are transacting. However, the actual number of CSCs transacting daily, or transacting more than a few times a day, has remained low. Employees at the CSC E-Governance Services India Limited, the special purpose vehicle (SPV) created for the project, say the “numbers are inaccurate and often fudged”. And an official says, “We don’t put it (the information) online as it will attract criticism and complaints. If you want information, you may send an RTI application.” The number of CSCs acting as business correspondent agents (BCAs) – agents who take banking services to the village level – too is very low. According to the joint parliamentary committee, the number of CSCs approved to act as BCAs was 28,111, but in January 2016, only 11,089 of them were active. In its explanation to the committee, the ministry had blamed the flop-show on: “Non-availability of broadband connectivity, lack of power, left-wing extremism in some states, termination of contracts with private service centre agencies, lack of e-services, etc...” And the committee had recommended that the execution of the project needed to be “overseen by a robust monitoring mechanism, coupled with structured planning and swift decision-making at the apex level”. It also called for addressing problems such as poor connectivity, left-wing extremism, inadequate power supply and so on. Having said that, CSCs got a new lease of life of late, with Aadhaar and other social security-related schemes being offered online at full swing. Last mile connectivity to the CSCs is also being bolstered under the BharatNet project, and in a revised strategy, CSCs are being allowed to buy bandwidth from private internet service providers and even retail it to villagers by using radio/Wi-Fi technology. Tyagi says his organisation is planning to make it mandatory for VLEs to register some Aadhaar-related activity by March 31 if they want to remain on this platform. Another important function CSCs serve as the country moves towards cashlessness is to take banking to places where banks do not have full-fledged branches. All it takes for a VLE to become a BCA is taking the rural authorised person (RAP) exam. Farshwal is one of those who has cleared the exam. “For nine villages, there’s only one ATM and one bank here, so basic services like withdrawal and deposit of money will help people a lot,” he says. Efforts are on to establish Aadhaar-enabled payment systems at these centres. “We have launched this system along with the National Payments Corporation of India, and there are 60,000 CSCs that can already deliver payments via Aadhaar,” says Tyagi. VLEs are also doubling as trainers, educating people on going cashless. Farshwal, for instance, ran an eight-to-10 day campaign to educate shopkeepers and villagers in managing without cash. The biggest problem, though, seems to be lack of internet connectivity. “I’m waiting for the government’s NOFN to reach here. It will be much better then,” says Farshwal. He currently uses Airtel’s broadband connection, for which he pays Rs 1,100 a month from his own pocket. He has also paid a one-time fee of Rs 15,000 to erect a cellphone tower in Duhai, a small town in Ghaziabad. Tyagi says his organisation is piloting a ‘Digital Village’ project, aimed at providing Wi-Fi connectivity. “With the help of the ministry of telecom, we are making villages Wi-Fi enabled. They have already approved 5,000 villages for the pilot phase. Some villages already have fibre cables. We will take the connection from NOFN and provide Wi-Fi to the whole village. Since we have the ISP licence, we will also be able to sell internet packs to villagers,” explains Tyagi. A tie-up with BSNL and Airtel has been established for providing bandwidth, and the project is under the ministry of electronics and information technology (MeitY). So far, the pilot has been completed in 600 locations – Haridwar, Faridabad, Pondicherry, Haryana and Jharkhand. If it’s deemed a success, it will be expanded to 15,000 villages.